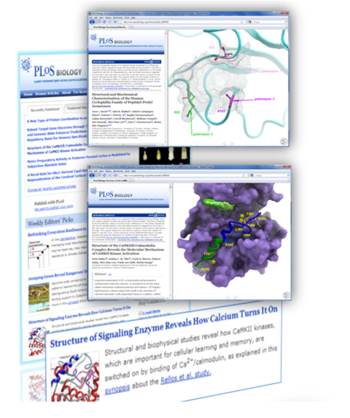 Protein Modeling | Virtual Screening: Ligand and Structure-based | Lead Optimization | Cheminformatics Solutions | Software Development. The main aim of Molsoft's Contract Research and Consulting Services is to help in the advancement of our client's research and development objectives through lasting and collaborative relationships. We provide solutions to specific scientific problems in the area of drug design, improvements in workflow, and the management of data, information, and knowledge, tailored directly to our customers' needs. All our services are undertaken in house by MolSoft's expert research scientists. We use MolSoft's well respected, versatile, and extensive suite of ICM software. Collaborations can be short term, multi-year and are either fee for service or FTE-based. See our Success Stories site to see some of our published achievements using MolSoft's proprietary ICM software. By applying MolSoft's acclaimed ICM modeling tools we can build three-dimensional models and fully evaluate several candidate target genes. Building and optimization of three-dimensional model for each target of interest based on existing homologues with known structure. 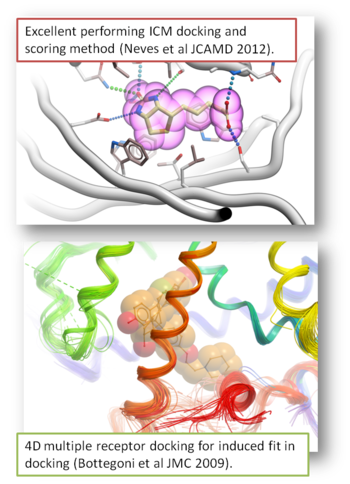 Identifying all potential "drugable" sites and pockets in a protein crystal structure or model. Evaluating model errors and structural flexibility around sites of interest. 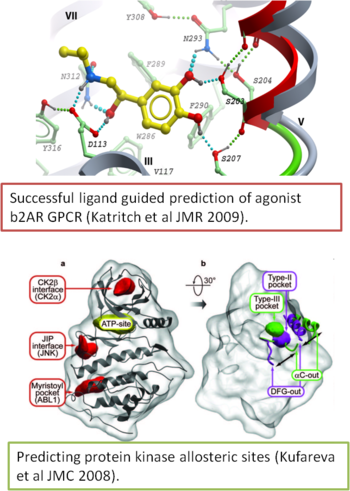 Docking all known ligands to the binding sites of a target to validate a ligand binding pocket model. Re-docking the ligands to flexible representations of binding sites to improve the pocket models for further virtual ligand screening. Investigating the structural effects of mutations on a protein structure. Prediction of protein-protein interfaces and interactions using MolSoft's ICM protein-protein docking software. Read about some success stories here. 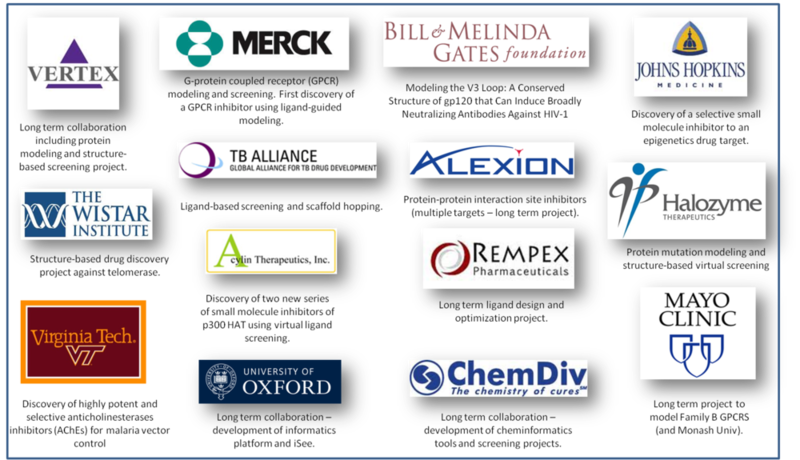 The highly specialized research environments of life science industries require an experienced understanding of the drug discovery process. Many prescription drugs are the result of small molecules that were synthesized in large combinatorial libraries and tested ad hoc against potential targets. This random approach requires substantial capital investment and yields a minimal number of potential drug candidates. As an alternative to performing traditional high throughput screening, Molsoft's Virtual Ligand Screening methodology can conduct in silico high throughput screening of multi-million vendor or combi-chem compound libraries while experimentally testing only a few hundred or thousand of candidates. Molsoft has been a leader in modeling and docking technology and through continuous development and growth intends to maintain this position. MolSoft curates a library of >10 million commercially available compounds and building block fragments for virtual screening. 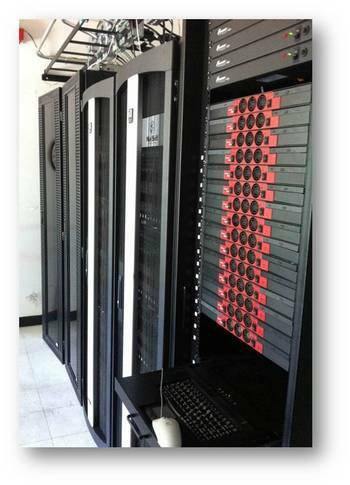 MolSoft's 1000-core supercomputing cluster facility enables us to screen >2 million compounds per day. Screening on the cloud is also available if extra capacity is needed. See some of our published small molecule discovery stories here. Generalized pharmacophoric approach (Atomic Property Fields). 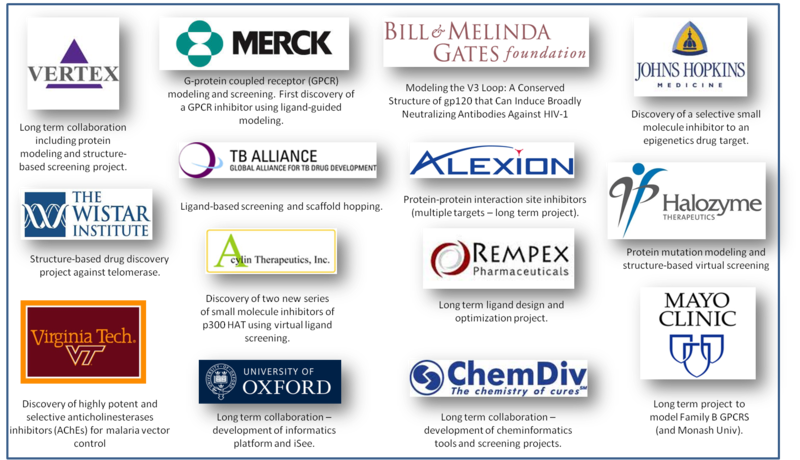 We have a panel of more than 470 pre-prepared models of validated drug targets. Can be used for lead discovery and prediction of specificity. High throughput screening using MolSoft.s acclaimed ICM docking technology. We can screen millions of compounds to a single receptor or an ensemble of conformations to incorporate induced fit (4D Docking). Hits are clustered and then a selection of high scoring and diverse hits (~200) are recommended for experimental testing by the client. Scaffold hopping and lead optimization. 3D conformational analysis and generation including peptides and macrocylces. Cheminformatics: property evaluations, compound clustering, data mining in public and private databases (ChEMBL), library enumeration. Cheminformatics solutions are commonly applied during the lead qualification and optimization process as it applies to small molecules and proteins. 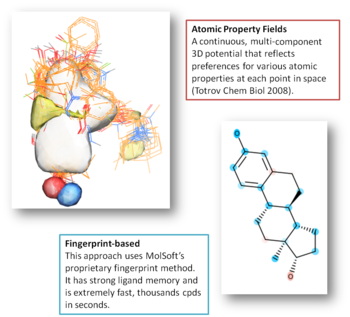 Molsoft's Cheminformatics applications include structural analysis, simulation and molecular libraries. Molsoft in a collaboration with Biovitrum AB, Sweden, is co-developing a Cheminformatics Client System using Molsoft's proprietary programming languages and libraries. This product, called BeeHive, is already being used by Biovitrum and the Structural Genomics Consortium as a program manager and database interface for chemical searches, analysis, and integration. We also provide services for developing custom database and information management systems. For example, we recently developed the ChemDiv's Chemistry on Demand E-Shop. Molsoft's Contract Research and Consulting Services division also provides software development using our libraries of routines for scientific data analysis and molecular manipulations. Molsoft develops interface software and the infrastructure necessary to allow communication between instrumentation controls and the data produced by those controls. The software developed is able to manage the data generated, to permit access to the databases of generated data, and to permit visualization and analysis of the data. Once a milestone has been achieved or the project has been completed, MolSoft's scientists will communicate the results to the cliet in a number of different ways as described below. MolSoft's scientists are available throughout the project to discuss the results and progress either in person, by phone, online via webex. Delivery of a single file molecular document with all the results fully annotated and hyperlinked to 3D molecules. Delivery of the results in a fully interactive web page using ActiveICM. 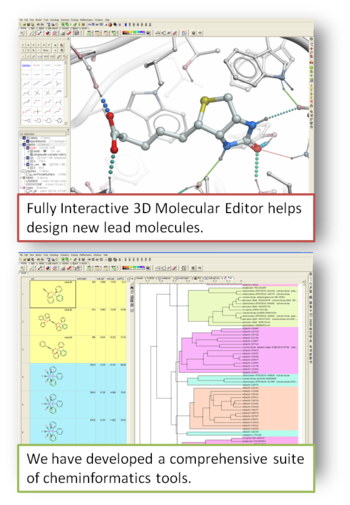 Delivery of screening results in fully-interactive hitlist tables whereby the client can easily view the ligand-receptor complex or lead compound in 2D and 3D. Delivery of the results in a portable formate (e.g. a PDB file, SDF file, csv, Excel or high resolution image.